Preface: I’ve been borderline harassing Geoffrey Zakarian on social media for the last 2 months or so. It’s escalated to the point where almost daily I’m telling him that I’m going to work for him for free and help take his brand to the moon. He’s more or less a superstar in my eyes, but there’s room for improvement on the creative side. I’ve already given him some ideas, so I have no doubts I can bring value to him. GZ, if you’re reading this, let’s have a chat because I’m dead serious. This was my third time at The Lambs Club. It’s been two years, probably, since my last visit. For reasons unbeknownst to you, the reader, it’s been a work in progress to get back inside The House That Geoffrey Zakarian Built. My hiatus came to an end Tuesday night. Let’s break it down. 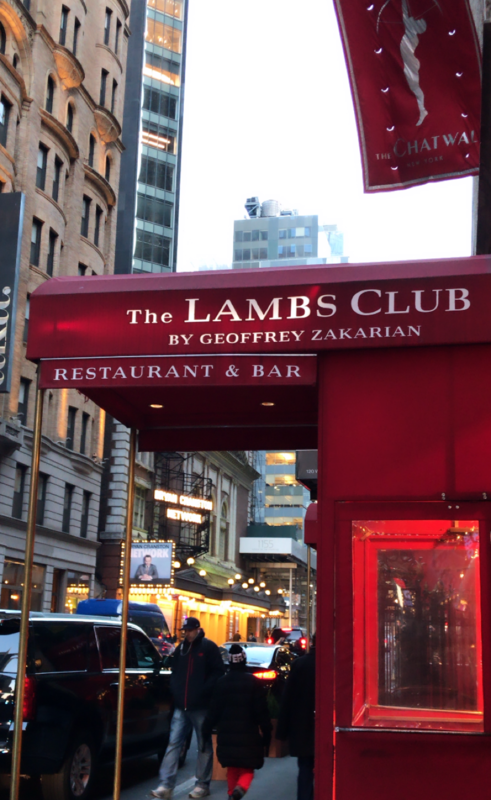 The Lambs Club is an interesting spot. It’s smack in the middle of Times Square but is far from a tourist trap (aka it’s pricey). If you can get your hands on the corporate card, consider The Lambs Club. Right through The Chatwal Hotel lobby, there are bright red booths and a massive fireplace that catch your eye immediately. It’s a hot spot for the pre-theater crowd, and the pictures all over the walls remind you of exactly that. There’s a 1950’s vibe, waiters dressed in all white suits, a bit of a time warp. Nonetheless, it’s a cool place. Alright, enough chit chat. We ordered two (2) appetizers. The Yellowfin Tuna l’Occidental was outstanding. It was served in a creamy sauce and a delicious, citrusy marinade and topped with crispy fried shallots and a microgreens garnish. My only complaint was that there wasn’t more of everything. My brother and I nearly licked the plate clean. We also got the Mushroom Soup, which was fine. It was good but a little simple and underwhelming. I will say that our server tried to upsell us with fresh truffle shavings. When you drop the word “truffle” around me, you’ve got my attention. When you say it’s an additional $30, you’ve lost my attention. Nice try, Chad. My brother ordered the steak entree which came with bone marrow. 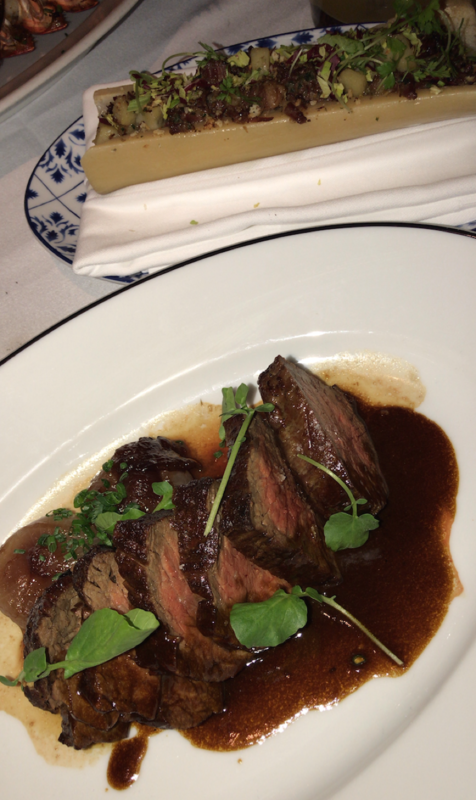 The steak was very good albeit a little closer to medium than medium rare. Whatever brown sauce it was in was dynamite. It pains me to say that the bone marrow was a major let down. The handful of times I’ve eaten bone marrow before were religious experiences. This was a combination of bone marrow, potato (I think? ), and some herbs and spices. Had it been an add on, and not part of the dish, it would have been even more of the disappointment. 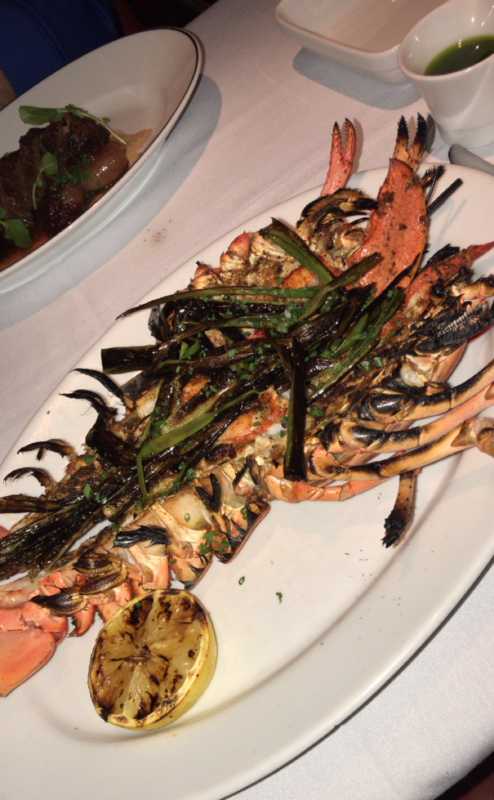 I ordered the Lobster “a la Plancha” which was a home run. It was finished off in a hot pan which gave the lobster meat a little crisp to it. Don’t think I’ve ever had lobster meat that was both crispy and tender. It came with a green butter sauce which was somewhere between an acidic chimichurri and a buttery pesto. Naturally I poured it all over. No Ragrets there. The grilled green onions and lemon were a great addition too. I was skeptical of it being served inside its shell, but there was no fight needed to extract the meat. Highly recommend if you’re a lobster eater. Order the Gold Rush if you’re a whiskey drinker. Order the Gold Rush even if you’re not a whiskey drinker. Trust me. This dessert was called Milk & Honey. 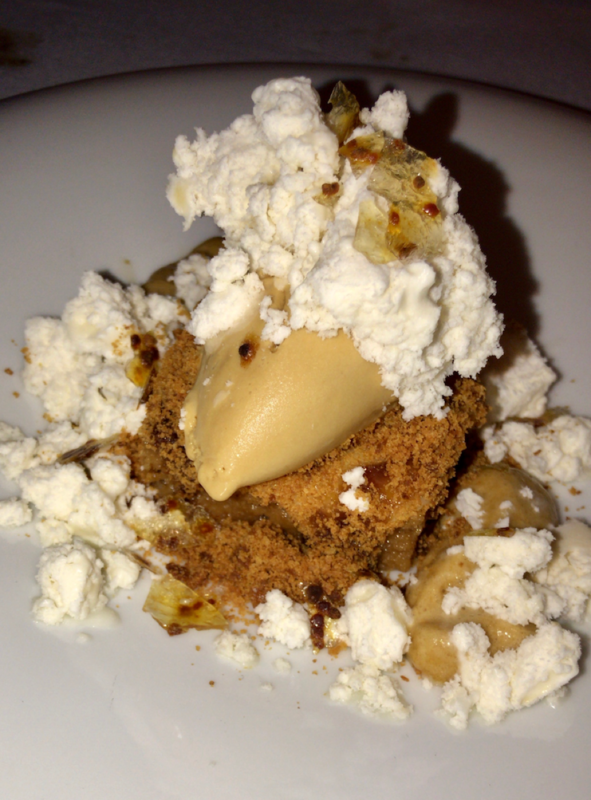 It’s Caramel Cake, Milk Jam (whatever that is), Passion Fruit, and Burnt Honey Ice Cream. Are you serious? Look at that masterpiece. This was easily the star of the night. It’s hard to describe exactly what the Milk Jam was so I’ll best describe it as ice cream that turns into cotton candy. Goodness gracious, this is a must have. OH AND ONE MORE THING. We met Geoffrey Zakarian. I got his attention as he walked by, and he was nice enough to stop and say hello. He even initiated the handshake. Sadly he declined my invitation to join us, but I’ll let it slide. Legend. As if a meal from the Geoffrey Zakarian braintrust wasn’t enough, meeting him in person was the cherry on top. Thanks, GZ for a delicious meal. More importantly, thanks for doing what you do. Keep an eye out for my name.